Delegate Jim Butler (R-Gallipolis Ferry) and State Senator Eric J. Tarr (R-Scott Deport) take questions at a town hall meeting on Saturday at the Mason County Library. 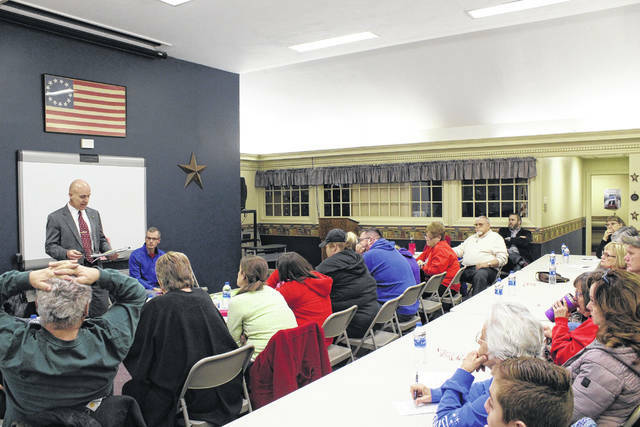 POINT PLEASANT — Prior to Monday’s public hearings on Senate Bill 451 (known as the omnibus education bill), a town hall meeting about the legislation was held on Saturday at the Mason County Library. The meeting was organized with help from the Mason County Democratic Women’s Organization, and moderated by Elizabeth Marciao, a teacher who lives in Mason County but works in Kanawha County, and is a representative of the American Federation of Teachers. Though all local legislators were reportedly invited, on hand were Delegate Jim Butler (R-Gallipolis Ferry) and State Senator Eric J. Tarr (R-Scott Deport) to take questions. Butler and Tarr attempted to go through the bill, item by item, and talk about the intention of the bill and changes it has gone through since leaving the State Senate for the House of Delegates. After discussing each change, the two legislators would take questions. Around 50 people were in attendance, the majority of them identifying themselves as educators or service personnel. A major source of discussion was the bill’s language on charter schools. Butler said one of the main differences between the House and Senate versions of the bill as it related to charter schools, was, the bill currently in the House, lowered the amount of charter schools to two in the entire state, as a sort of pilot program. He explained these schools would have to be existing public schools where a majority of staff, parents and the local board of education would have to approve the switch (or conversion) to a charter facility. If the school would fail, it would revert back to a public school with the same teachers, staff, students. “I guess the thing you gain, is that you gain an opportunity to find a better way to do things…this is an opportunity to try something, if it doesn’t work, they’ll be revoked, it’s a pilot program anyway and you’ve really lost nothing, it’s a great opportunity to improve things for the kids,” Butler said. Also, 90 percent of the state funds that would normally go towards a student in public schools would then “follow that student” into the charter school which previously existed as a public school. Charter schools would also have an opportunity for federal funding to make up funding shortfalls. Charter schools would have to follow the same performance standards and standardized testing for public schools. Charter schools are also to be non-profit. What some saw as money “following the student,” to charter schools, others at the meeting saw as taking funds away from public schools. “You said it doesn’t take money away from schools, our schools…we are losing population, so you say we’re not taking money away but you are because you’re taking population away from schools, which takes money away from those schools, because the money is determined by population,” Mitch Meadows, who attended the meeting, said. Butler stressed “we’re not taking anything,” saying, charter schools would require the “will of the community” to exist, by requiring approvals from the majority of faculty, parents, the local school board and it would have to operate within state restrictions. “Let’s put those efforts back into what we have now instead of trying something totally, 100 percent different,” Meadows said. Tarr said these trends had been ongoing for a decade. “We have student needs that are not being met,” Tarr added. In addition, there was confusion over the proposed 5 percent pay raise for teachers and service personnel, as to whether it was truly a 5 percent raise based on individual salaries, or an average of specific salaries. Also discussed concerning the bill, the need for more school counselors, smaller class size, concern over the “cookie cutter” nature of the original legislation and where it came from, the certification process for teachers at charter schools, voters approving tax levies, not school boards, the power of administrative officials when it comes to staff and more. The meeting lasted two hours. The Point Pleasant Register will continue to follow the progress of the bill now in the House.